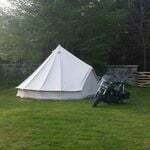 A small, family run tent only campsite, in a peaceful rural setting, just a few minute walk from the charming Victorian seaside town of Llanfairfechan, the beach, restaurants, cafes and pubs. Eleven pitches, flushing toilets, free hot showers, heated shower rooms, large undercover seating areas with picnic tables, with extras available to hire which include fire basket, bag of logs and kindling, chairs and Hog Roaster Hire. Ideal for couples, groups and get togethers, where you can book for exclusive use of all or part of the site. A ten berth modern Bunkhouse also available. A short ride from the Snowdonia National Park, Llanberis, Caernarfon Castle, Anglesey and Aber Falls. Undercover barn area for bikes. An 5* site, delightfully situated between the coast road and the sea, with a pleasant 25 minute stroll along the promenade to the seaside town of Barmouth, on the Mawddach Estuary, with a Blue Flag beach. All the facilities you would expect, including clean shower blocks, disabled facilities, on-site shop, cafe and take-away. 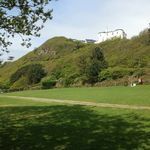 Nearby attractions include Snowdonia National Park, Dolgellau, Harlech, Bala, Beddgelert, Betws-y-Coed, Blaenau Ffestiniog, Caernarfon Castle, Porthmadog and much, much more. Sea-fishing and boat trips are available from the harbour. Barmouth lies between a mountain range and the sea, with slate roofed houses, quintessential charm and a rich history. A choice of eateries including cafes, bistros, Knickerbockers with 30 flavours of delicious ice cream and Mermaid Fish Bar; listed as one of Britain's top fish & chip shops. 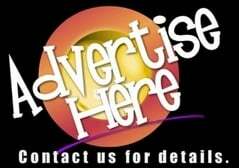 Also available two static caravans. Special offers for couples in Spring and Autumn. Parking next to pitch. traditional county town of Monmouth is a short ride away with pubs, cafes, places to eat and get supplies. An ideal base for touring Monmouthshire, close to the Brecon Beacons, Wye Valley, Chepstow, Hereford, Symonds Yat and the Forest of Dean. The area has a rich heritage, with many castles and fortifications; Caldicot, Raglan and Abergavenny Castles, Tintern Abbey, Monmouth Priory and The Roman baths and amphitheatre at Caerleon echo. 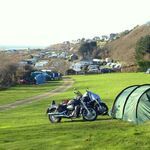 Biker Friendly Campsites, Camping, Wales, Waunfawr, Caernarfon, Gwynedd, Llanddrewi, Brefi Road, Tregaron, Ceredigion, Talgarth, Brecon, at the heart of Southern Wales. within easy distance of the capital City of Cardiff, the Maritime City of Swansea, golden sandy beaches, ancient castles, picture-postcard villages, the Brecon Beacons National Park and surrounded with acres of breathtaking mountain scenery and country parks just waiting to be discovered. 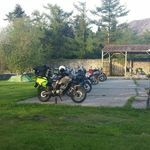 There are country pubs nearby and it's just a short ride to the seaside resort of Porthcrawl, biker camping welcome, touring on a motorbike, campsites, in an absolutely stunning location in the heart of the Black Mountains. In a peaceful part of southern Powys, close to Talgarth, Abergavenny and Hay-on-Wye, surrounded by superb Welsh countryside.